Choose from 8 ProDSS ODO/CT kits. Kits include a ProDSS handheld with or without GPS, as well as an ODO/CT probe and cable assembly with cable lengths up to 20 meters. The ODO/CT probe and cable assembly features integral (i.e. built-in) optical dissolved oxygen, conductivity, and temperature sensors. 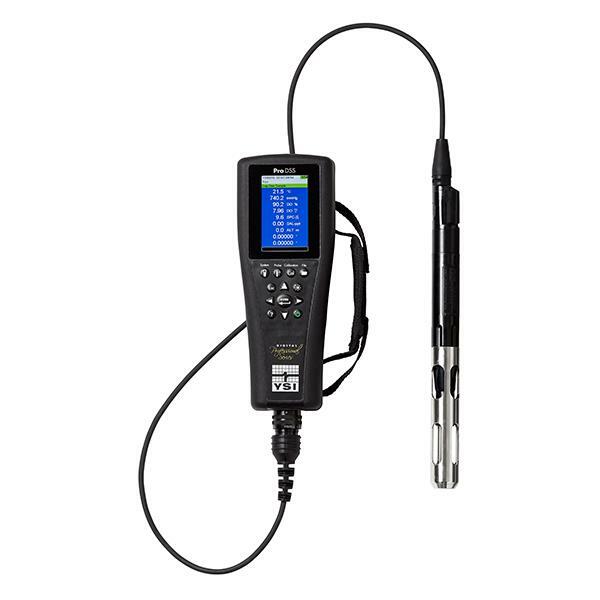 The ProDSS handheld with an ODO/CT probe and cable assembly is ideal for measuring dissolved oxygen (DO) and conductivity in the following applications – estuary, wetland, coastal, aquaculture, or any application requiring accurate, real-time salinity-compensated DO measurements. The ODO/CT has all the advantages of optical dissolved oxygen technology – higher accuracy, less maintenance, no stirring required for accurate measurements, holds calibration longer than membrane covered sensors and is not susceptible to interferences from other gases. Large memory stores over 100,000 data sets and 400 GLP records. 100 user-defined sites and 100 data IDs are available for easy data management. Site images can be added to the handheld with KorDSS PC software (included). 627100: Includes a ProDSS handheld with GPS and a 1 meter ODO/CT probe and cable assembly. 627101: Includes a ProDSS handheld with GPS and a 4 meter ODO/CT probe and cable assembly. 627102: Includes a ProDSS handheld with GPS and a 10 meter ODO/CT probe and cable assembly. 627103: Includes a ProDSS handheld with GPS and a 20 meter ODO/CT probe and cable assembly. 627104: Includes a ProDSS handheld without GPS and a 1 meter ODO/CT probe and cable assembly. 627105: Includes a ProDSS handheld without GPS and a 4 meter ODO/CT probe and cable assembly. 627106: Includes a ProDSS handheld without GPS and a 10 meter ODO/CT probe and cable assembly. 627107: Includes a ProDSS handheld without GPS and a 20 meter ODO/CT probe and cable assembly.